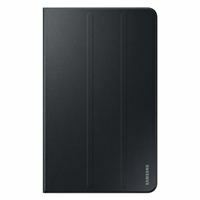 The Samsung Galaxy Tab A 10.1"Book Cover provides full coverage for your device in a slim and lightweight iconic leather design. Cover is adjustable to 2 convenient viewing angles - viewing mode and touch mode. Plus it's easy to use, with a magnetic connection and device on/off.